This website provides up-to-date maps depicting the geographical distribution of ixodid ticks. The first map depicts a total of 2,044 georeferenced tick locations in Germany. It is based on a digital dataset comprising the following tick species: Ixodes ricinus (1,855 locations), Ixodes apronophorus (1), Ixodes frontalis (1), Ixodes hexagonus (1), Ixodes trianguliceps (4), Dermacentor marginatus (77), Dermacentor reticulatus (96), Haemaphysalis concinna (8) and Hyalomma marginatum (1). The tick map for Germany shows I. ricinus occurring in the whole federal territory, while D. marginatus has been restricted to the climatically favoured region of the Rhine valley. Clustered locations of D. reticulatus were also documented in the Rhine valley as well as in Berlin and its vicinity. Map of georeferenced tick locations in Germany (Rubel et al., 2014). The second and third map depicts Dermacentor species in Europe, again based on georeferenced sampling sites. Therefore, a dataset was compiled, resulting in 1286 D. marginatus (Sulzer, 1776) and 1209 D. reticulatus (Fabricius, 1794) locations. Special emphasisis given to the region of the European Alps depicting a presumable climate barrier of the mountains andto overlaps in the distribution of both species as well as on the situation in eastern European countries. For the latter newly described Dermacentor findings comprise 59 locations in Romania and 62 locationsin Ukraine. The geographical distributions of both species in Europe range from Portugal to Ukraine (and continue to the east of Kazakhstan). Although it is well known that D. marginatus is adapted to a warmerand drier climate at more southern latitudes and D. reticulatus to a moderately moist climate at morenorthern latitudes, the distribution limits of both species were not well known. Here, the northern andsouthern distribution limits for both species in Europe, as determined from the georeferenced database,were specified for D. marginatus by the belt of 33-51° N latitude and for D. reticulatus by the belt of 41-57° N latitude. Thus, overlapping species distributions were found between 41° N and 51° N.
Map of georeferenced Dermacentor marginatus locations in Europe (Rubel et al., 2015). Map of georeferenced Dermacentor reticulatus locations in Europe (Rubel et al., 2015). Georeferenced Dermacentor data are currently used for habitat modeling and will be provided at the beginning of 2016. The first German map of georeferenced ixodid tick locations. Geographical distribution of Dermacentor marginatus and Dermacentor reticulatus in Europe. Ticks and Tick-borne Diseases, in press. The data collection was supported by the German Federal Environmental Agency, project FKZ 3713 48 402. The castor bean tick Ixodes ricinus (L.) is the principal vector for a variety of viral, bacterial, and protozoan pathogens causing a growing public-health issue over the past decades. However, a national density map of I. ricinus is still missing. Here, I. ricinus nymphs in Germany were investigated by compiling a high-resolution map depicting the mean annually accumulated nymphal density, as observed by monthly flagging an area of 100 m2. Input data comprise ticks collected at 69 sampling sites. The model domain covers an area of about 357,000 km2 (regional scale). Two negative binomial regression models were fitted to the data to interpolate the tick densities to unsampled locations using bioclimatic variables and land cover, which were selected according to their significance by the Akaike information criterion (AIC). The default model was fitted to the complete dataset resulting in AI = 842. An optimized model resulted in a significantly better value of AIC = 732. Tick densities are very low in urban (green) areas. Maximum annual densities up to 1,000 nymphs per 100 m2 are observed in broad-leaved forests. The tick maps were verified by leave-one-out cross-validation. Root mean square errors of RMSE = 137 and RMSE = 126 nymphs per 100 m2 were estimated for the two models, respectively. These errors are of the order of the interannual variation of the tick densities. The compilation of a high-resolution density map of unfed nymphal I. ricinus for Germany provides a novel, nationwide insight into the distribution of an important disease vector. Estimating Ixodes ricinus densities on the landscape scale. Int. J. Health Geogr., 14:23. A density map of the tick-borne encephalitis and lyme borreliosis vector Ixodes ricinus for Germany. J. Med. Entomol., 53, 1292-1302. Ticks of the species Ixodes ricinus (L.) are the major vectors for tick-borne diseases in Europe. The aim of this study was to quantify the influence of environmental variables on the seasonal cycle of questing I. ricinus. Therefore, an 8-year time series of nymphal I. ricinus flagged at monthly intervals in Haselmühl (Germany) was compiled. For the first time, cross correlation maps were applied to identify optimal associations between observed nymphal I. ricinus densities and time-lagged as well as temporal averaged explanatory variables. To prove the explanatory power of these associations, two Poisson regression models were generated. The first model simulates the ticks of the entire time series flagged per 100 m2, the second model the mean seasonal cycle. Explanatory variables comprise the temperature of the flagging month, the relative humidity averaged from the flagging month and 1 month prior to flagging, the temperature averaged over 4-6 months prior to the flagging event and the hunting statistics of the European hare from the preceding year. The first model explains 65% of the monthly tick variance and results in a root mean square error (RMSE) of 17 ticks per 100 m2. The second model explains 96% of the tick variance. Again, the accuracy is expressed by the RMSE, which is 5 ticks per 100 m2. As a major result, this study demonstrates that tick densities are higher correlated with time-lagged and temporal averaged variables than with contemporaneous explanatory variables, resulting in a better model performance. 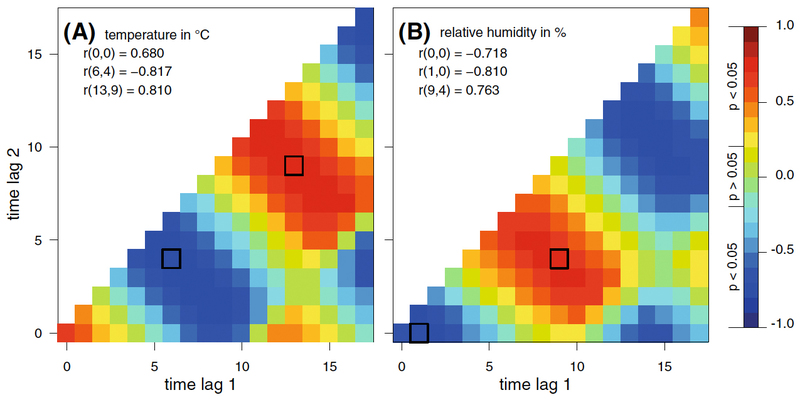 both (A) temperature in °C and (B) relative humidity in %. (Brugger et al., 2017). The model was developed using the R statistical computing environment (R Development Core Team, 2017). Seasonal cycles of the TBE and Lyme borreliosis vector Ixodes ricinus modelled by time-lagged and interval-averaged predictors. Exp. Appl. Acarol., in press, https://doi.org/10.1007/s10493-017-0197-8.